I really do not like to admit that at one time I gave in watched a bit of the movie Final Destination II. Never saw the first one. Haven’t seen any of them since. I have no intention to. I have resolved that if something creates unnecessary stress or anxiety in my life, and is totally optional, such as a movie, then why engage in it? However, there is one takeaway from it that I cannot escape, and I have noticed it throughout many areas of life. This is where one thing affects another, which affects another, and do on. In the movie, these things were actually causes, not only affects, but the point is still there. Things happened totally independent of each other, but one affected or caused the next, which did the same to the next. In the movie, unfortunately, this always led to the gruesome early death of our on-screen characters. There are countless areas of our lives that move to influence other areas or events in our lives, and we are mostly unaware of these. Fortunately, most of them are not of the type from the movie above. But even positive influences can change our lives. This is known as a Trickle-down affect. Trickle-down is used in a couple of different ways. In our society, it has become resonant with economics and how taxes of the rich affect the lives of the workforce. But, even more basic, and how we will look at it, this idea is described as water moving downhill until it hits an obstacle. It fills up to the limits of the obstacle. Once full, it gradually overflows it to continue downstream to the next one. Since water always travels in a downward motion due to gravity, it will continue until it hits an obstacle or finds the final destination of its course. With water, as long as it stays in its liquid form, the final destination is always the ocean. While it may get stopped before that and never make it there that is the furthest water can ever go. As water hits those obstacles, and builds up to the top, the earliest overflow can be in small steady streams, or even a small trickle. Add in going down, we have a trickle-down motion, that is, water traveling from one higher source to a lower destination. While the high source enjoys the benefits of the water, the lower place does without until this trickle-down affect begins. Then, as it accumulates the water, it becomes a higher source for the next lower place, and so forth. So, how does this change our lives? As Christians, we strive to become more like Christ. We attend and serve at church and give our offerings. While we help in the local missions serving food to the homeless, we also travel abroad taking medicine and Christ to 3rd world nations in order to our part in fulfilling the great commission. We try to be there for our friends. We do these things and much, much more. Works are evidence of our faith as we grow, and a necessary part of our daily lives. Rich Mullins’ song “Screen Door on a Submarine” sums it up nicely. But we must also remember that they are not the source of our salvation. Works, while important, are not what being a Christian is about. 8 For it is by grace you have been saved, through faith—and this is not from yourselves, it is the gift of God — 9 not by works, so that no one can boast. 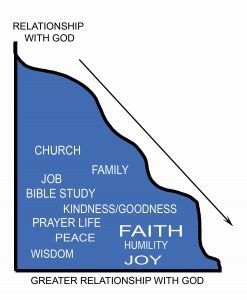 So as we worship and show evidence of our life in Christ through works, we also study on the Fruits of the Spirit, to become more humble, more at peace with joy in our lives to pick a few of those. We study passages such as The Beatitudes and The Lord’s Prayer. We spend time in the writings of the New Testament to know the history of the early church and to find a better definition of what a follower of Christ should be. All of this is important in the life of the body of Christ, very much alive and well in the world we live in today. But, as far as our personal lives, the Fruits of the Spirit and how we live our lives is directly affected by how we progress in one area. It is this trickle-down affect that comes into play and helps everything else happen. Our relationship with God hasn’t grown, and so the scopes of the areas of our life that are affected are minimal. We see many areas of our life grow, and the fruits of the spirit grow even stronger. 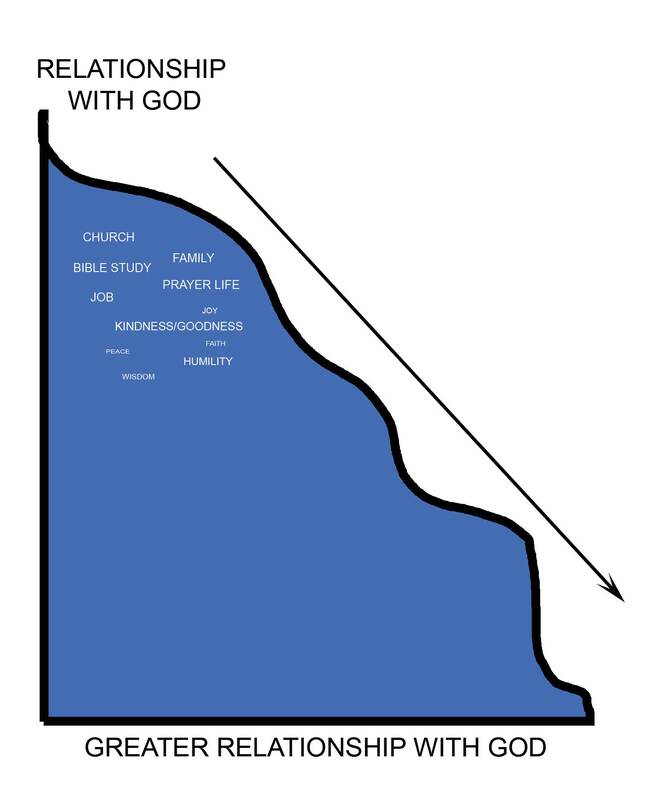 But the growing is fully dependent on our relationship with God. If you have a hard time seeing the trickle-down analogy, then consider a snowball instead of water rolling down a hill. Each one of those virtues is a different snowball. The closer you grow to the Father, the more the snowball rolls. We know that as a snowball rolls, it gathers up more snow and becomes even larger, or in this case, greater. The same is true for the virtues and areas in our lives. God wants this relationship with us. It started with creation. It is why He created us in the first place. 1 John reminds us that we are children of God. and Paul reminds us that he wants a relationship with us. So, above all else, Father, Son & Holy Spirit wants a growing relationship with us. This aspect of our lives should trump everything else. All other practices and growth of virtues grow from this one point. Therefore, concentrate on building a greater relationship with Christ. Grow through prayer, Bible study, constantly seeking Him, giving things up in faith. Then watch Him work to see the evidence of His love and presence grow in your life. Without fail, faith, wisdom and humility will naturally grow. Then you will find a new, pure quality of peace and joy that is unsurpassed. Will problems cease to exist? Absolutely not. We live in a fallen world. But we will be able to endure and look forward to the day when Christ returns and it is not a fallen world anymore! In that day, we will continue our worship and praise and grow in Him to even newer levels, which is what He’s wanted since the creation of man.